These are other Horticultural Links RVO finds useful. 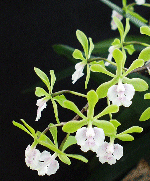 This Epidendrum floribundum blooms on canes 7-8 inches tall. The flowers are the size of quarters, massively clustered and wonderfully fragrant. orchid-Bids Orchid Auctions An outstanding source of orchid plants, growing supplies, greenhouses–everything for the serious hobbyist. Debbie’s Garden Links one of the UK’s most comprehensive gardening links sites! The Fanciful Gardener Become a fanciful gardener! Use your imagination to create the garden of your dreams. We carry beautifully-crafted cedar and willow arbors, gazebos, garden screens and edging, whimsical stepping stones and wall plaques, fountains and birdbaths, colorful pots and planters, garden statutes and whimsical garden accents, birdhouses, and garden furniture. Dgmra. Flying High: Uniquely colored and shaped, this is a hybrid no collection should be without. Sundance Supply Another great greenhouse site. Provides information and supplies for ventilation, heating and misting equipment, as well as custom greenhouse design and installation. Clayton Hill Greenhouse Company We design, construct, and install custom greenhouses, Victorian greenhouses, and conservatories for commercial and residential uses nationally; built to meet your requirements. Paphs.net The internet meeting place for people who love the Orchid Paphiopedilum. All kinds of good information on Paphs.. Give them a visit.